I moved from Castle Rock to Highlands Ranch last week. I have decided that moving is a severe disruption to life! For the two months ahead of time I was sorting and packing. Now I am unpacking, organizing and finding a new home for all my treasures. Thanks to the help of a number of friends and my sister and daughter I feel like I am well on my way to getting back to my sewing machines. I have missed them. Today I was able to stitch a little binding together which I will put on a charity quilt as I watch a little TV tonight. 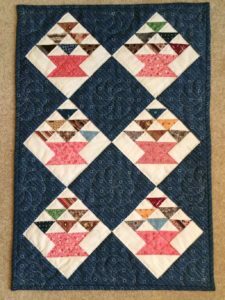 Sorry – I have digressed from my usual Blog about little quilts. Here are some more gems from my visit with Jane Nelson. This is another great wall grouping with a cute shelf full of baskets and quilt “things”. Are you inspired yet to create a clothes line of little quilts? The advantage is that you don’t even have to sew a sleeve on the back when you use clothes pins to hook them on the line. 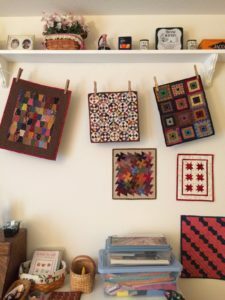 That makes it easy to rotate different quilts for different seasons. 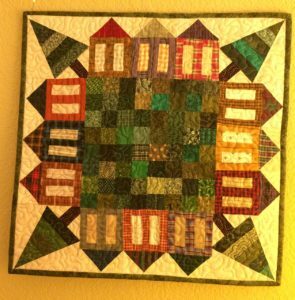 Look at this delightful quilt she created with houses and trees with the front lawn made of little green squares. I wish I lived on this block. I bet every home has a quilter living there. Or take a look at this next one. Jane just loves indigo fabrics and this time she hand quilted little wreaths in each section of indigo background. It really sets off the baskets with their muslin background. I appreciate the scrappy look she has created. I find it amazing that just six little blocks can make such a sweet doll quilt. That is part of the beauty of doll quilts. They don’t have to be complex to be adorable. One more that I want to share is a bit more complex looking but not when you break it down. It starts with a 9 patch and then it is snowballed with two strips in each corner. They almost remind me of a table full of buttons. Thanks again to my friend Jane for sharing part of her collection with us. 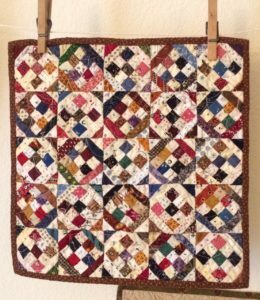 Just for You – Quilt Quote “When I learned to quilt, I forgot how to cook”.